A savory and sweet, crunchy and filling late summer salad with roasted potatoes and shrimp, chopped celery, and whole grapes in a dilled yogurt-mayonnaise-lemon dressing. I've been doing a lot of walking to train for a half marathon, and part of my walking has been to pick up milk at the local grocery store. Normally I have Simon (the photobombing dog below) with me, waiting patiently at the dog tie up & water station, so I don't linger in the aisles. The other morning, however, my daughter and I walked together, and after walking in the woods (just found out there's elevation changes on the course, so I need to get some hills in) she and Simon headed home and I headed to the store for milk (and to pad my mileage). 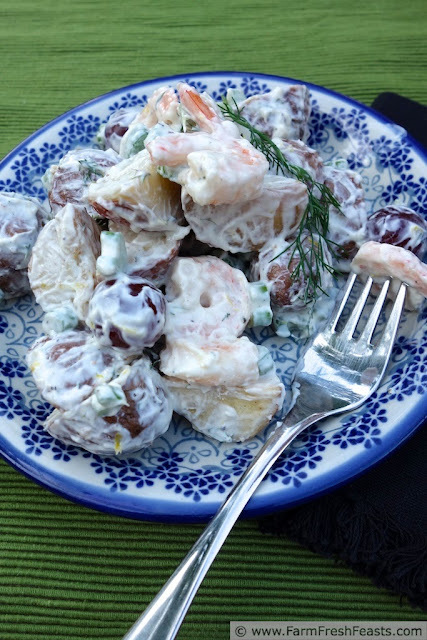 I had time to linger over the deli section, and two salads in particular caught my eye--a dilled shrimp, celery, and grape salad and a dilled lemon potato salad. On the way home (lugging a gallon of milk is not the hassle it used to be--a side benefit of having kids who go through a gallon every 36 hours) I wondered what would happen if I combined the two salads and, for grins and giggles, roasted the potatoes and shrimp instead of boiling or steaming them. Since the celery I'm regrowing in my garden is doing amazingly well (of course it is, since I'm only meh on celery by itself, though I love it in soup packs and to help stretch a pound of ground meat) I figured I'd try and combine the recipes. Our farmers have a nifty new tool, a potato digger, and we've been getting lovely harvests of red potatoes lately, so I had most everything I needed. I played around with my kitchen scale again, like I did in my Chicken Salad by the Ounce recipe, but this time in metric form. The volumes in this recipe are my estimation of the weights I used. Yes, I grew that celery and the dill. My bad self. Preheat oven to 400 degrees Fahrenheit. Cube potatoes into large-yet-bite-sized chunks (we're not talking dainty hash cubes here, I mean bigger chunks). Place in a large bowl, and toss with a splash of olive oil, a pinch of salt, and a few grinds of pepper. Empty into a rimmed baking sheet (don't clean the bowl yet). Roast in preheated oven for 30 minutes. Remove from oven. 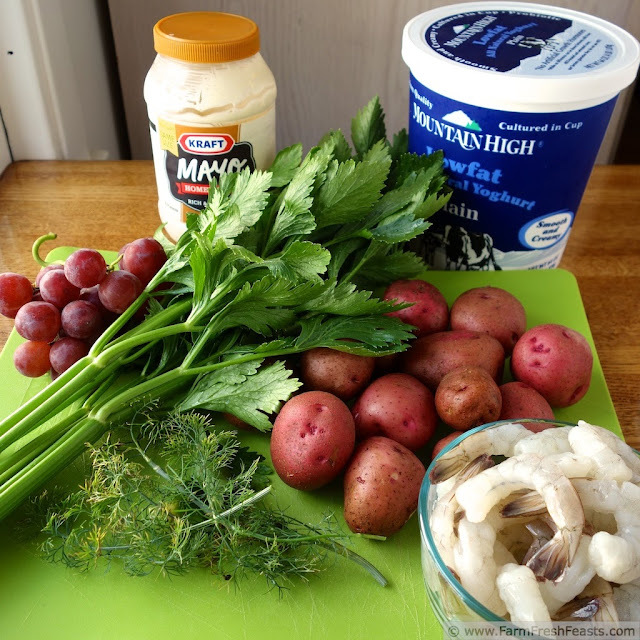 Toss the shrimp in the remnants of oil in the bowl and add to the baking sheet with the potatoes. Roast another 8 to 10 minutes until the potatoes are browned and the shrimp are opaque. Set aside to cool down a bit. In a large bowl (same one as before, if you've washed it in between) combine yogurt, mayonnaise, dill, and lemon zest. Add the chopped celery and toss. 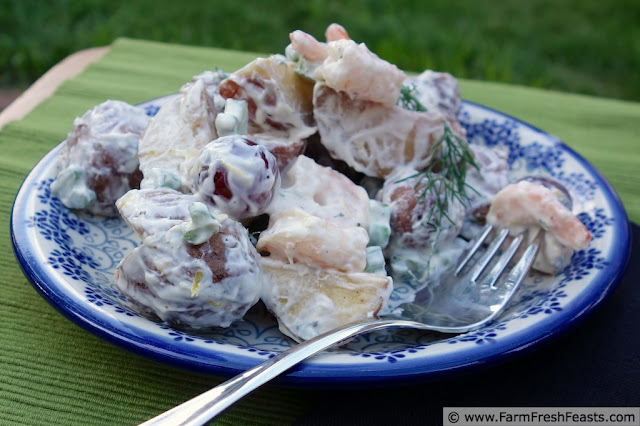 After the potatoes and shrimp have cooled somewhat (I like mine lukewarm or room temperature) toss them with the celery-yogurt mixture. Add grapes, toss to coat, and taste to adjust seasonings the way you like it. You can serve this over salad greens or just eat it straight off the plate like we did. I prefer this at room temp, not chilled, but my son liked the chilled leftovers. Do you think up recipes while you walk? Am I crazier to walk a half marathon or to routinely carry a gallon of milk a mile home? I love it when a dish catches my eye and then I come home and make it. Kudos on training for the half marathon. I just recently started running and am registered for my 3rd 5K on 9/21. Drag N Fly. drag yourself up a 1000 foot elevation and "fly" down. I have been practicing on a 500 foot elevation hill in my neighborhood. Hope I do well. I'll be thinking of you flying while I'm dragging myself up mile 10-11! Good luck on your run--I don't think you could even pay me to run, but I enjoy walking. I definitely would roast the potatoes and shrimp. I love the caramelization you get with roasting. Of course we need our upper 90 degree temps to go away before I'll want to turn on the oven. We are supposed to get a cold front late tonight – bring on the cooler temps! I've been waiting for this cold front to can some more tomatoes! Bring it on indeed. Your recipes make me smile, specifically this line here: "we're not talking dainty hash cubes here, I mean bigger chunks." 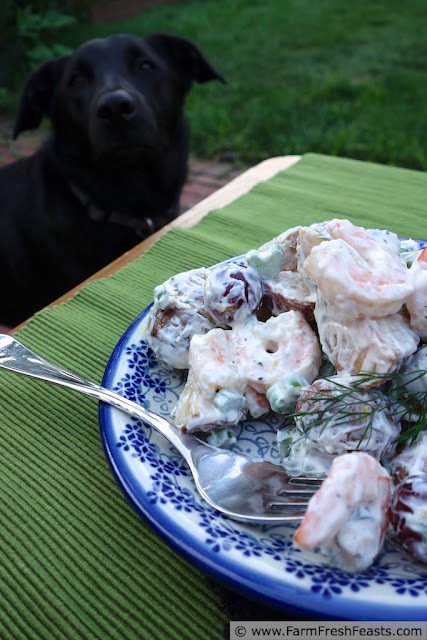 I think the idea of roasting the potatoes and shrimp as opposed to the boiling them is genius, and your post is perfectly timed. We've got CSA potatoes and celery. I just need to snag some dill. I need to remember to snag dill plants earlier in the season, but, fingers crossed, my dill will re-seed itself next year. I've certainly ignored it enough to cause plenty of seeds to drop! Thanks--I was trying to be as descriptive as possible! Oh and I think it's more crazy to carry a gallon of milk a mile on a routine basis. This looks fantastic!! I need to do more with grapes now that they're more in season. Yum!! And I'm inspired by all your walking. I used to do lots of that, plus a little running, and I definitely need to get back into it. Have your spouse sign up to walk with you, then leave a couple of months later so you're on your own for the actual event. Can I get a woot woot?! Yeah, I didn't think so. Still, it's good to have goals and all. Oh I have pinned this for later. This look fantastic! How did you grow your celery. Can you use a celery you have and cut the bottom off to start? Thank you for sharing this on Seafood Frenzy Friday Kirsten! Thanks for hosting--always a surprise when I have a seafood recipe in time for your Frenzy. Yes, yes it is fancy. It's good to live a little, now and again.